This Sunday, the Albert Einstein College of Medicine hosted their 23rd annual Wild Wild West Carnival Family Day in Bridgehampton, NY. With loads of activities and games for kids and a special performance and meet and greet with Elizabeth Gilles, Jade from Nickelodeon’s Victorious – families and friends were in for a real treat. 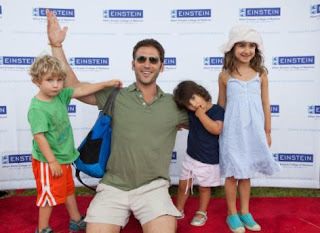 Royal Pains star, Mark Feuerstein enjoyed some of the activities with his children, while actress Bridget Moynahan attended with her family and friends. Families were treated to an array of amazing activities – western hairstyles courtesy of Cozy’s Cuts for Kids, fun tattoos by Glitter Toos and pony rides to name a few.